i woke up at 9am to use the bathroom and couldn't fall back to sleep. instead i got back out of bed, got dressed for dim sum with my parents at noon, and went out into the backyard to take photos. i was finally able to identify a few of the unknown flowers growing in the perennial garden. the plant designated as the "purple flower" turns out to be a lenten rose, which looks like a peony plant but with less flamboyant flowers. 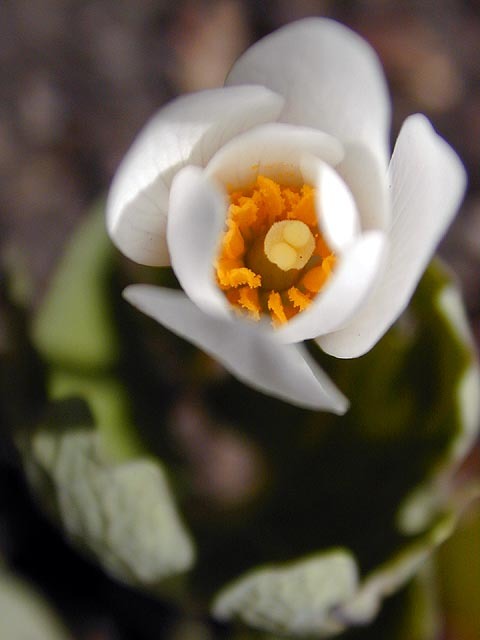 the flowers known as "white flowers 2" are actually bloodroots, so named because of their dark red rizhomes. "white flower 1" however, i still don't know what it is, and all my perennial books couldn't identify it (maybe i need to get a new book). the plant is very fuzzy down at the roots, with 6 petal white flowers on long stalks. the blossoms remind me of lotus flowers. we went to dim sum buffet at yangtze river in lexington center, along with my 2nd aunt, and my aunt and uncle who were biking to the restaurant. because it was probably right after easter sunday mass, the placed was packed with chinese christians all decked out in their sunday's best. because we didn't call to make a reservation, we had to wait for a table. the table we finally got was a crudely assembled set comprising of a rectangular table and a round table. jack, who works there, gave us the VIP treatment and brought out dim sum dishes for us before they were even on the pushcarts. like any buffet, you kind of eat to full capacity. i went slow, but eventually i hit my limit. my 2nd aunt treated us all, and then my father gave me a ride back to my place. andrew stopped by briefly. he saw the room again where he'd be living next month (only for the weekends, then for the rest of the summer starting in june). we watched some television (a hodge podge of baseball, basketball, blind date, and shallow hal), finished the rest of the grapes i bought yesterday, then he left to go visit his mother. finally, my parents came by my place around 7pm, where we had dinner. we also thought up some creative ways where i could rearrange the furnitures in the two bedrooms, to maximize the spaces.